I have a very big favor to ask to everyone who has uploaded something about Bleach. Please recommend me some good Toshiro Hitsugaya wallpapers! Enough with the favors, have a good time with this scan! 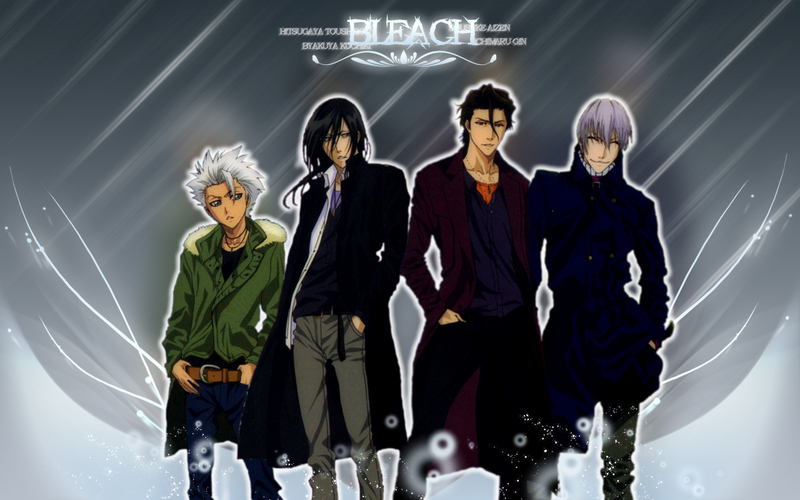 Aizen, Toshiro, Gin, and Byakuya are "glowing". Wow! Great :) There is Aizen too :))) Yayyyyy! That's really awsometastic dude! I have been looking for a wallpaper like this with them clothes on like that! Wow, this is awesome. I love to see them in street clothes. Byakuya looks GOOD! Really cool one!The one from the right has a nice style. The guy on the right is Gin Ichimaru. Thank You so much for this scan! Soo sexyy ? Thanks a lot for sharing! Thank you for the picture, it's pretty Cool! Aw. This is so cute. Gin is such a cute little thing. very nice.thanks a lot for sharing.